HELP SAVE AUSTRALIA'S NATIVE BEES! How to rescue a stingless bee nest in a fallen tree. Five ways to help save Australian bees. Australian native bees are under threat, in spite of the beauty and value of these remarkable insects. 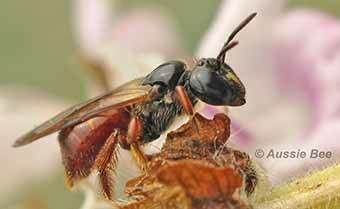 Our native bees delight observant gardeners with their dazzling colours and their fascinating behaviour. Our native bees are also vital pollinators --- they help our wildflowers to survive and increase the yield of many of our agricultural crops. Australia has over 1,700 species of native bees. They build nests in a wide variety of materials, such as hollow trees, old soft timber, woody stems, and bare patches of ground. Their nests can often be accidentally destroyed through landscaping, gardening and land clearing activities. -- Old dead canes of the weed Lantana are favoured nest sites of the amazing Reed Bees, Exoneura. These nests are often destroyed when Lantana is cleared in bush regeneration work or farmland management. Find out how Reed Bee nests in Lantana can be saved and relocated! 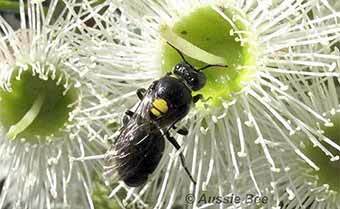 -- The majority of Australia's native bee species nest in burrows in bare ground. These nest sites may be destroyed in urban areas when these areas are converted to lawn or covered with pavers. Find out how urban gardeners can help save ground-nesting bees! -- The flower spikes of the Grass Tree, Xanthorrhoea, are favourite nest sites of the stunning Metallic Carpenter Bees, Xylocopa (Lestis). Landclearing for farming has caused so much loss of this bee's nest sites that they are no longer found in Victoria or mainland South Australia. Learn more! Pesticide use also has a major impact on native bees. Insecticides intended to kill pests in gardens or crops, may also be toxic to valuable pollinating insects such as native bees. Public awareness has recently soared about the effect of these chemicals, and pressure is mounting to ban certain formulations and develop less toxic alternatives. Study the wealth of information on Aussie Bee website and in our ANBRC publications so that you can discover your local native bees and learn how to encourage them. You also may like to attend a native bee seminar or special event. Then tell your friends and neighbours about our vital native bees and encourage them to join you in protecting and supporting them. Increasing public support for our native wildlife helps ensure its protection! Create a garden which will support your local native bee species. Certain plants are particularly good sources of nectar and pollen for native bees and other plants provide valuable materials for nest construction. Study the Aussie Bee guide to planting a Bee-Friendly Garden and take a look at our list of Flowers Loved by Native Bees. This native Masked Bee finds abundant nectar in gum blossom. Farmers can also encourage natural pollinators to visit their crops, and increase their crop yield, by allowing wildflowers to grow on strips of land beside their fields or along roadsides. Avoid using insecticides or pesticides wherever possible. Instead encourage natural insect predators in the garden or consider using biological pest control. If insecticide use is unavoidable, choose less toxic formulations, apply it only when bees are unlikely to be flying (for example, in the coldest part of the day or at night), avoid windy conditions and do not directly spray the plant's blossoms. Detailed advice on pesticide use. Watch out for native bee nesting areas, such as those described above, and protect these areas. Leave some areas of bare earth in your yard to encourage ground nesting bees and don't clear away old mature timber that is used by bees that nest in tiny crevices. 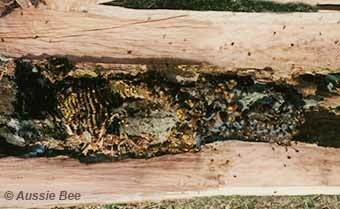 You can also create additional nest sites for native bees by setting up Bee Hotels. These can be made simply from inexpensive materials and are fun for all the family to create and observe. 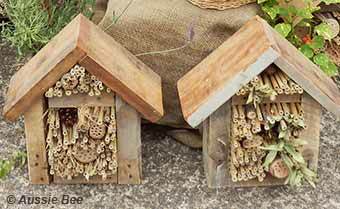 Read Aussie Bee's detailed guide to Making Bee Hotels. Bee Hotels like these support a wide range of native bees. Share your observations about native bees. Information about the distribution and behaviour of many native bee species is amazingly incomplete. Your observations could be most valuable and could help fill in important gaps! Can you help? Take part in the Wild Pollinator Counts that are held Australia-wide twice a year. You don't need to be an expert or have any specialised equipment. Just spend ten minutes watching insects that visit a flower in your garden or local park, note down what you see in simple categories, then submit your observations online. This is a wonderful activity for schools and community groups and adds to our knowledge of Australia's pollinating insects. 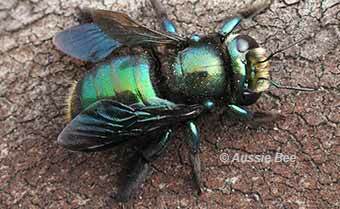 Another great way to contribute is to post your native bee sightings on BowerBird website. Just take a photo of your bee and upload it to the site where bee specialists will discuss and hopefully identify it. Sightings from BowerBird are passed on to the excellent Atlas of Living Australia website, adding to Australia's knowledge about our native bees. Together we can protect and support a beautiful group of Australian animals which are just as important and interesting as koalas and kangaroos. Our Australian native bees are charming, colourful insects, and they are vital to the Australian environment! Support the Australian Native Bee Research Centre. The Australian Native Bee Research Centre works to save the native bees of Australia through their research and public awareness programs. The Australian Native Bee Research Centre runs Aussie Bee website and publishes information booklets and a field guide to provide information on native bees to the Australian public. The Australian Native Bee Research Centre is privately funded. Donations from the public greatly assist the Centre's work to save the native bees of Australia. 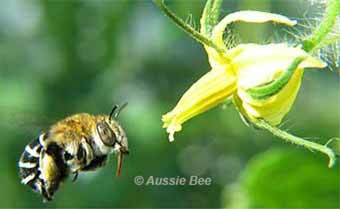 Sales of our publications also support the work of the Australian Native Bee Research Centre.